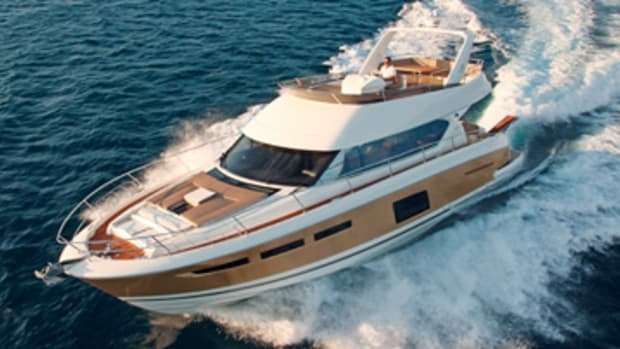 My first reaction on hearing that Jeanneau was introducing a big express to the United States was, "What does a French sailboat builder know about designing cruisers for Americans?" The answer, I learned, was "quite a lot." For this French builder traces its powerboat roots all the way back to 1956. The 50 is unabashedly French. Like all Jeanneaus, she&apos;s built in an enormous factory in Les Herbiers, France, and her design is, well, different. Onboard you&apos;ll find air conditioning controls in Celsius, a separate switch to turn the fuel gauges on and off, another switch to shut off all the bilge pumps except the aft (and largest) one, on and off push buttons instead of light switches, two breakers each for the bow and stern thruster (labeled positive and negative), a single "Domestic" breaker for all interior electricals, an absolutely piercing alarm for the sunroof (why don&apos;t cars have sunroof alarms? ), a garage hatch that opens only slightly faster than your lawn grows, and equipment that&apos;s well-labeled—in French (do you know the difference between bord and tribord? ), and a safe under the master bed. But different can be good, too, and on the 50 there&apos;s lots of good stuff. Like price. 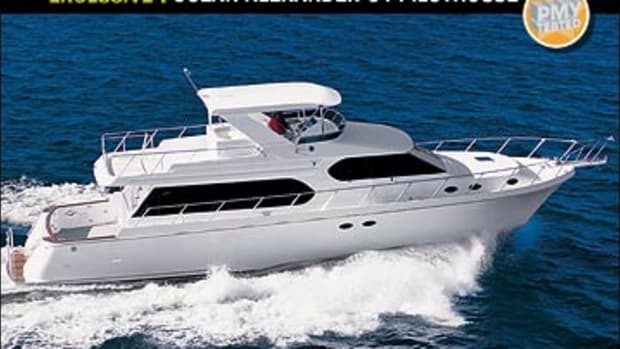 Nicely fitted out (except for the Raymarine chartplotter, radar, and autopilot) she lists for $815,000. You won&apos;t find Carrara marble or wenge wood, but neither is she cheaply fitted. 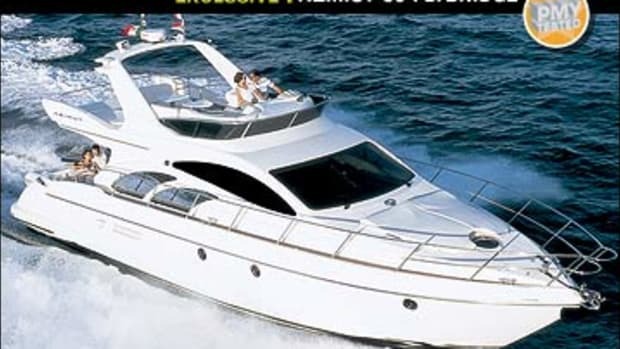 The high-gloss cherry interior is well crafted, the carpets are plush and seem durable, the stainless steel work is as good as you&apos;ll find in any production boat, the cockpit table is solid teak, and the gelcoat is well above average. And I heard not a squeak nor saw a major quality faux pas in my time aboard. 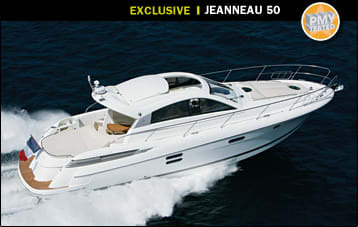 How does Jeanneau do it? Near as I can figure, when it compromises, it does so where you won&apos;t see it and where if you did, you might not care. So you have some plywood shelving (varnished) and glued instead of dovetailed joints. On the other hand, when&apos;s the last time you saw a 50-footer with 7&apos;0" of headroom and a walk-in closet in the forward stateroom? 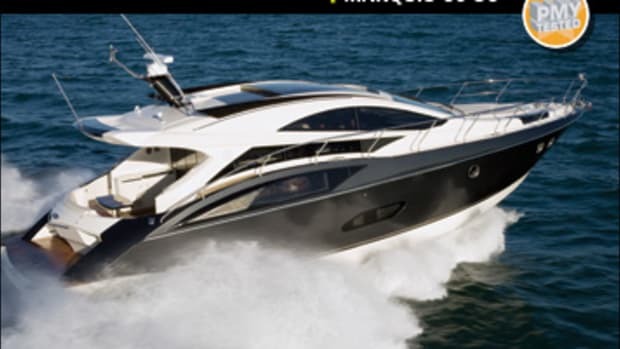 Besides, this boat is a pleasure to run. Her electronic power steering is quick—four turns lock to lock, though there are no "locks," so you can spin the wheel forever. As you can see in our test results, her running angles are about average, sound levels are above average, and she tops out at nearly 37 mph. She responds quickly to tabs and stays on plane down to about 1750 rpm. Sightlines are good except at the forward corners, which have wide mullions. The instrument panel is stylish and efficient, except that the gauges are so far from the helm seat I couldn&apos;t read them. 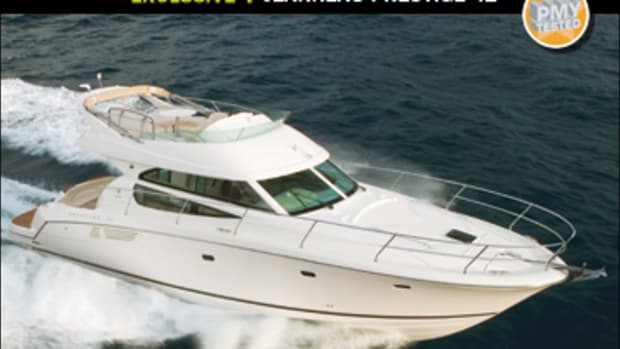 My major complaint: Everything between the helmsman and windshield is white fiberglass, which creates a lot of glare. On the other hand, comfort is a big plus. 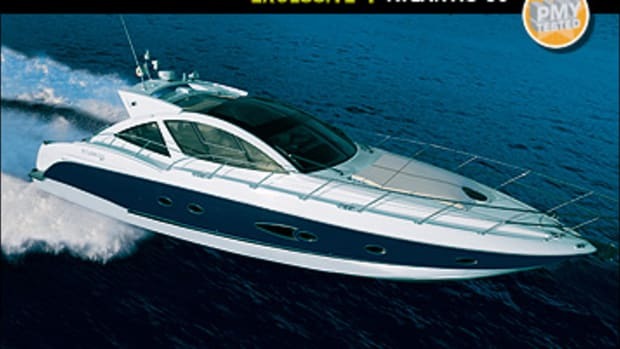 The 50 can be had with three staterooms, but don&apos;t go there unless you&apos;d like a midcabin VIP with its head in the bow. Our two-cabin layout&apos;s the ticket. I couldn&apos;t figure out which was the master—the forpeak&apos;s got the big walk-in, but the aft cabin&apos;s bigger and brighter and has a desk/vanity. (Its hanging locker doesn&apos;t go to the ceiling. Go figure.) 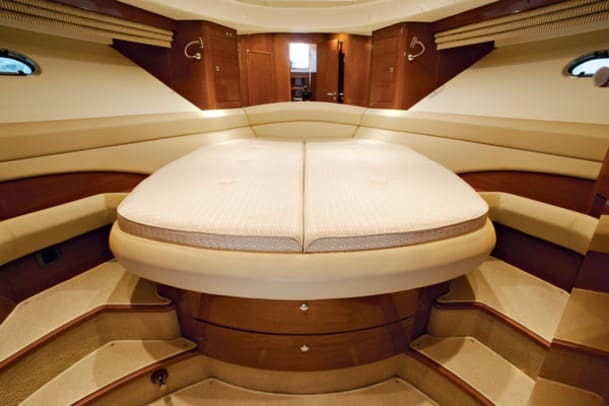 Between the two staterooms are a workable galley with an American-size refrigerator and an LCD TV that rises from the galley island. As to the garage, opinions about such places versus extended swim platforms are hotly held. It&apos;s my sense they&apos;re falling out of favor in this size range. That said, this is a good design, although you&apos;ll have to pony up for an electric winch to haul in your RIB. (Is there an alternative?) A major benefit is the great sunpad atop; a major drawback is engine access. There&apos;s just 16 inches between the Volvo Pentas. Access to the clear raw-water strainers, dipsticks, and fills is fine, but I never saw the filters. I did spot the fuel-water separators, one on each saddle tank and neither with clear sediment bowls. If this kind of stuff bothers you, don&apos;t blame the boat, give up the garage. I liked the 50 despite her few quirks. She&apos;s smartly designed and well put together, and has a killer price. The quirks? They give her panache, and that&apos;s a compliment in any language. 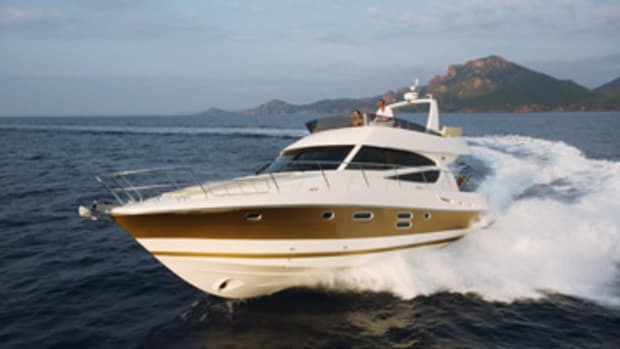 For more information on Jeanneau, including contact information, click here. It all started with M. Henri Jeanneau fiddling around in his father&apos;s workshop after competing in the Six Heures de Paris powerboat race. 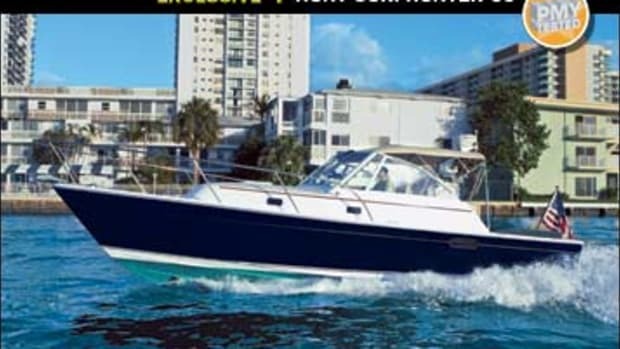 Out of that came the first Jeanneau boat—not a sailboat but an outboard-powered dinghy that debuted in 1957. 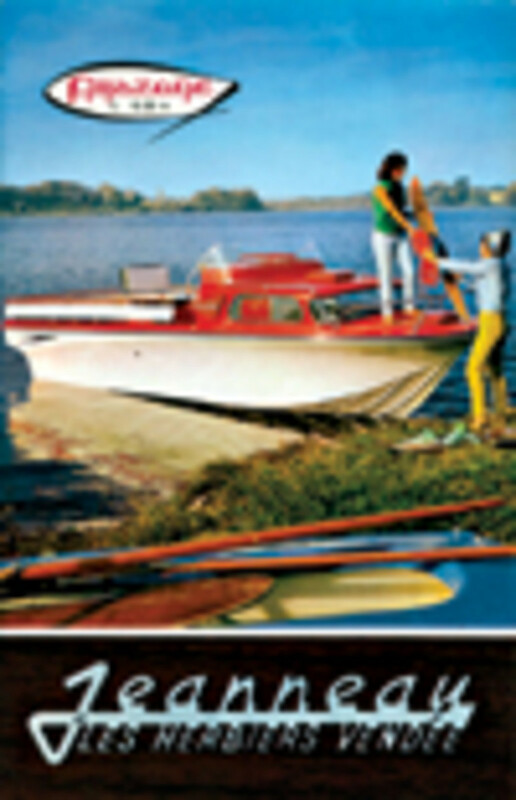 By 1958—well before many American builders—the company was molding boats like the Amazone speedboat out of FRP. 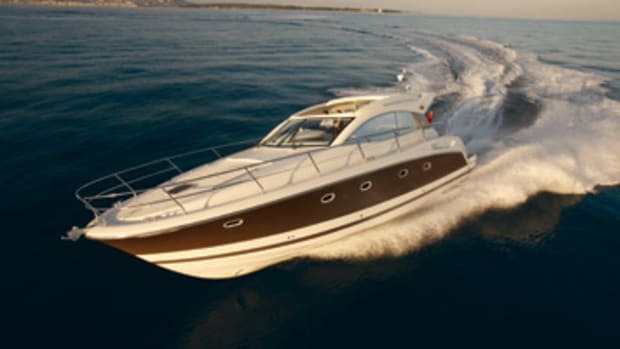 By 1960 Jeanneau was selling all of the Amazones it could build, and it has been a force in European boatbuilding, both power and sail, ever since. This year it celebrates 50 years since the first Amazone hit the water.—R.T.